Debora Petrina sings Feldman's "Only"
Photo by David Prando Singer, pianist, and composer, Debora Petrina goes from a solid preparation as a classical and contemporary pianist to the use of electronics and keyboards, to composition for different kinds of ensemble, to a unique use of voice and dance. 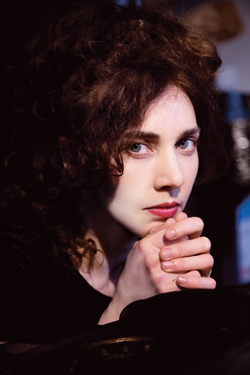 Winner of several Italian awards as a songwriter, Petrina has aroused the interest of David Byrne, whose webradio has hosted her songs many times, and of John Parish: they are both guests on her album Petrina (AlaBianca/Warner). Composers Sylvano Bussotti, Terry Riley and Frederic Rzewski have expressed great appreciation of her as a composer and pianist. She has also collaborated with Elliott Sharp, Mike Sarin and Jherek Bischoff. She has played world and European premieres of pieces by Cage, Feldman, Maderna, Rota, Togni, Bussotti, and Katunda in places like La Fenice Theatre (Venice), Mills College (Oakland) and Conway Hall (London). She has performed her own music mainly in Europe and the U.S. She has recorded a CD and a DVD for the US label OgreOgress with all premiere recordings (Early and Unknown Piano Pieces by Morton Feldman and Morton Feldman - Barbara Monk Feldman), and has also participated in A Call for Silence, a recording project by Nicolas Collins for the Sonic Arts Network, UK. She is one of the four pianists of Four Pianos by Sylvano Bussotti, premiered in Italy in 2013 and subsequently published on CD by Stradivarius. Petrina is also a performer in a broader sense: she has danced in international projects of such choreographers as Iris Erez and Sara Wiktorowicz, and she has choreographed herself (her solo piece She-Shoe has been featured at the International Dance Film Festival 2008 in Yokohama, Japan). She performed at the Venice Biennale in 2013. She has also composed a choreography for Morton Feldman's Three Dances, which she performs in the double role of pianist and dancer. Her latest album for voice and piano, Roses of the Day (2015), was produced by Paolo Fresu, one of Europe's most respected jazz musicians, for his new label dedicated to voices, T&ubreve;k Voice. The piece which gives the title to the album,"Roses of the Day", is signed by Petrina and John Cage, and the score is available from C.F.Peters. Morton Feldman's early song "Only" for solo voice (1947) sets a poem by Rainer Maria Rilke. The recording below is the first to use the text with the minor correction issued by Universal Edition in 2011. The recording is made available here by kind permission of Debora Petrina.